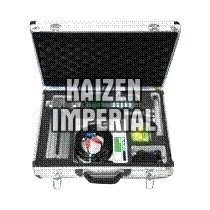 We are engaged in offering a huge assortment of high performing Portable Ultrasonic Flow Meter. This device measures flow rate by calculating the spread time of ultrasonic wave in a liquid, going upstream and downstream go into a full pipe. Primarily used for measuring the flow rate of homogenous fluids, these devices are suitable for measuring aggressive fluids or very soiling fluids. Besides, this device comprises of one or more ultrasonic transducers that are coupled with the external pipes wall and a portable unit.